An entirely new 3D printing method that prints 25-100x faster than currently available technologies has been introduced. 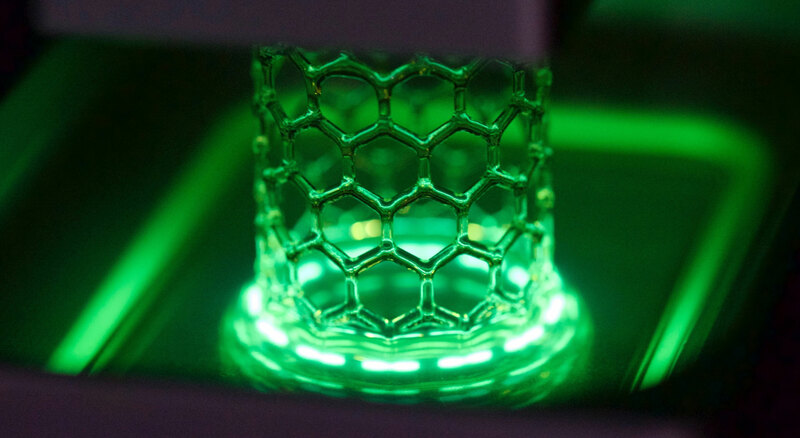 The new process called Continuous Liquid Interface Production Technology (CLIP) works by using light and oxygen to change a photosensitive liquid resin into a three dimensional solid object. The process is similar to Stereolithography (SLA) where liquid photopolymers are cured using ultraviolet light. However instead of depositing material layer by layer, the object is formed at once. CLIP places a pool of liquid resin over a digital projection system which projects an image for how each layer should form. To create an object, bursts of light and oxygen are applied; light hardens the resin while areas exposed to oxygen are kept from hardening. Proposed advantages of this technology include radically faster processing time and ability to use wide range of materials that make stronger objects. This technology can potentially be extremely useful in the health care industry if models can be printed within a matter of minutes and enable preoperative planning of surgical procedures that may be time sensitive. Previous entry Which 3D printer should you get? Whoa. Thanks for sharing Tatiana. For surgical planning, speed is a major issue. Now all we need is one-click design software and 3D printing will be as easy a regular laser printing! Here is a TED talk that the founder gave on this revolutionary printer. I am really intrigued by the potential of this new approach to 3D printing.